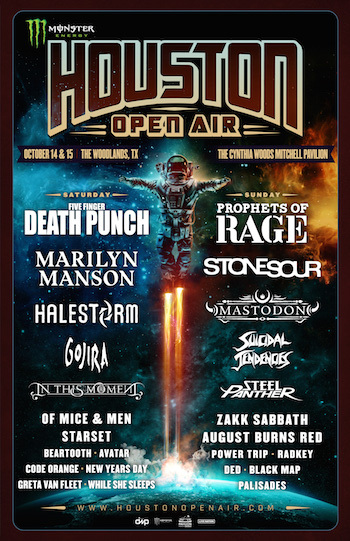 A hard-hitting music lineup has been announced for Monster Energy Houston Open Air—Texas's biggest rock experience—Saturday, October 14 and Sunday, October 15 at The Cynthia Woods Mitchell Pavilion presented by Huntsman in The Woodlands, TX. Five Finger Death Punch, Prophets of Rage, Stone Sour, Marilyn Manson, Mastodon, Halestorm, In This Moment, Gojira, Of Mice & Men and Suicidal Tendencies lead a lineup of 25 bands performing on two stages. Monster Energy Houston Open Air also features multiple onsite experiences and a Texas-sized food experience underscoring Houston's emergence as a great American food city. Monster Energy Houston Open Air 2017 is produced by Danny Wimmer Presents in association with Live Nation. Tickets go on sale Friday, June 16 at 10:00 AM CT at www.HoustonOpenAir.com, www.LiveNation.com and www.Ticketmaster.com. See below for details. Danny Wimmer, founder of Danny Wimmer Presents says, "After a tough year, with nearby lightning creating challenges for Houston Open Air 2016, we're excited to return to the Houston area this year. As we said then — and reaffirm now — we're committed to building an incredible rock show for the Houston rock community. It's not our preference to stop a show, or inconvenience anyone by having them seek shelter or leave the facility, but we take dangerous weather conditions very seriously and will not compromise anyone's safety. Looking forward to bringing the rock back to Texas!" Jason Rio, President of Live Nation Houston, says, "Houston is a great Rock City and Open Air is a great Rock Festival. We are proud to be partnering with such a well-respected company as DWP, along with our friends at CWMP and 94.5 The Buzz to bring the 2017 Houston Open Air festival to the Woodlands." Single day and weekend tickets for Monster Energy Houston Open Air will be available at www.HoustonOpenAir.com starting on Friday, June 16 at 10:00 AM CT. Fans are encouraged to buy early and save, as ticket prices will increase in the coming weeks. Weekend passes start at just $66.66, and single day tickets start at $45.00. VIP upgrades are $40.00 per day or $75.00 for the weekend. Each VIP upgrade pass includes access to The VIP Lounge (located in the Event Center) which features air conditioning, a live video stream of main stage performances, VIP-only restrooms, and dedicated concessions (for additional purchase); a VIP-only entrance into the venue; and a commemorative Houston Open Air laminate. Discounted online hotel rates will be available through Curadora. Visit www.HoustonOpenAir.com for details. Monster Energy Houston Open Air will feature a Texas-sized food experience underscoring Houston's emergence as a great American food city. Initial food vendors for Monster Energy Houston Open Air include: Brazilian Bistro, Cousins Maine Lobster, El Guajillo, Texas Taco Depot, and The Grove Truck. Look for many more to be announced soon. The Dyin 2 Live Dreams Program is a wish-granting organization whose purpose is to try and enrich the lives of those fighting cancer by offering them an experience that will bring hope and inspiration to their lives. In doing this, we hope it can help give them a chance to forget, even if it's only for a day, what they are battling. Through our extensive network of friends, supporters, and affiliates, we are able to reach out to individuals and present them with one of a kind experiences and opportunities that arise. We feel a Dyin 2 Live Dream can offer a source of inspiration for those undergoing difficult medical treatments and be a positive force that offers a life-changing impact not only on them, but also the family to overcome their obstacles. If you are currently fighting cancer or know of someone in the fight who could benefit from a Dyin 2 Live Dream, please submit your story and tell us why and how a Dyin 2 Live day would help. Also, anyone interested in being a supporter, volunteer, or donor, please contact us at mywish@dyin2live.org. Sponsors and media partners for Monster Energy Houston Open Air include: Monster Energy, CWMP, 94.5 The Buzz, Fxck Cancer / Dyin 2 Live, Razor & Tie, Century Media, Bud Light, and Take Me Home, with more to be announced. The Cynthia Woods Mitchell Pavilion presented by Huntsman is an outdoor amphitheater surrounded by lush forests located in The Woodlands, TX, approximately 30 miles north of downtown Houston.